Here I am! Come see me! As soon as the snow melts and there are a few warm signs of spring, I begin to poke around in my flower beds looking for shoots. The first ones I see are from a plant called Resurrection Lilies. 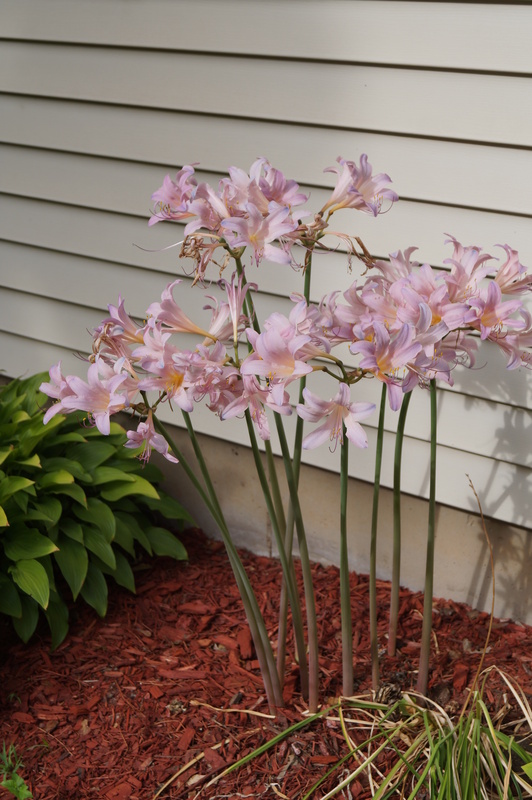 Some people call them Surprise Lilies or Naked Ladies. Here’s why. 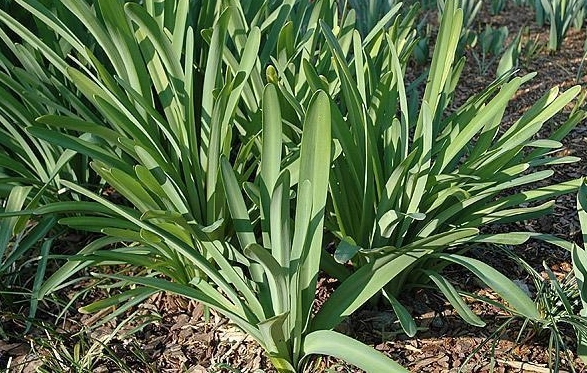 In early spring, long, wide leaves form a leave mound. The leaves are about one foot long and have round tips. They are green for quite a while. Then one day, usually in early June, they begin to die off. Just as the other flowers in my beds are becoming vibrant shades of green, the Resurrection Lily leaves look like it is fall. Or going through a drought. I yank them out of the bed. And wait. And wait. And wait. Then, in early August, new shoots sprout up. Almost overnight, the shoots get a couple of feet tall. 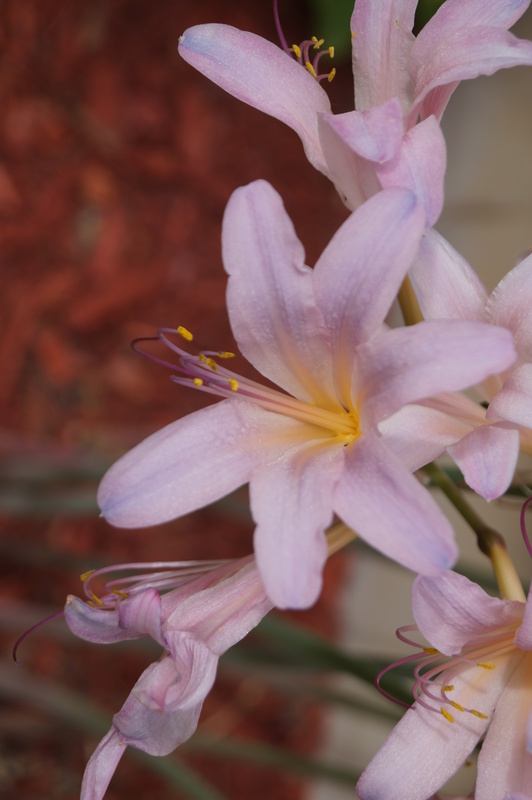 In short order, beautiful pale pink lilies appear. They bloom for about 10 days. Interestingly, when the flowers bloom, their stem is completely naked; why some people call them Naked Ladies. Last week, the Resurrection Lilies in my beds were beau-ti-ful! And I mean beau-ti-ful! They were so stunning that Rick asked me if I had planted more of them. They are a bulb and reproduce and multiply themselves without me having to bury more. While these lilies are called a variety of names, I prefer the term Resurrection Lily. Simply because they remind me of what happened to Jesus. As God’s Son, he came to earth. He bloomed where he was planted. Helped people grow in faith. He multiplied fishes and loaves to “feed” the people. Just when things seemingly were going good, he was yanked from society, condemned to die and endured a horrific death. His body was laid in a borrowed tomb. After waiting three very long days, some women went to his tomb and discovered his body was gone! While Mary was still in the garden, Jesus came to her and flowered her with the wonderful news that he was not really dead but very much alive. Unfortunately, the Resurrection Lilies are nearing the end of their life cycle this year. But I have complete hope they will be back next year; once again reminding me of this very special story. A story that never grows old. Lord God, we often encourage each other to “bloom where we are planted.” And this is exactly what the Resurrection Lilies do. Just as these beautiful plants go through a specific life cycle, encourage us to think of our life cycles and how various stages happen. May we go forth and allow ourselves to bloom where we too have been planted. Amen. On the edge of Mazomanie where we live is the Walking Iron Park. It has lots of hiking trails and a place I have enjoyed hiking and trail running for years. I hadn’t been on the trails this year. And I’ve been feeling quite disjunctured these last few weeks. Searching for something that seems misplaced or lost. Trying to figure out what this next phase of my life might look like. 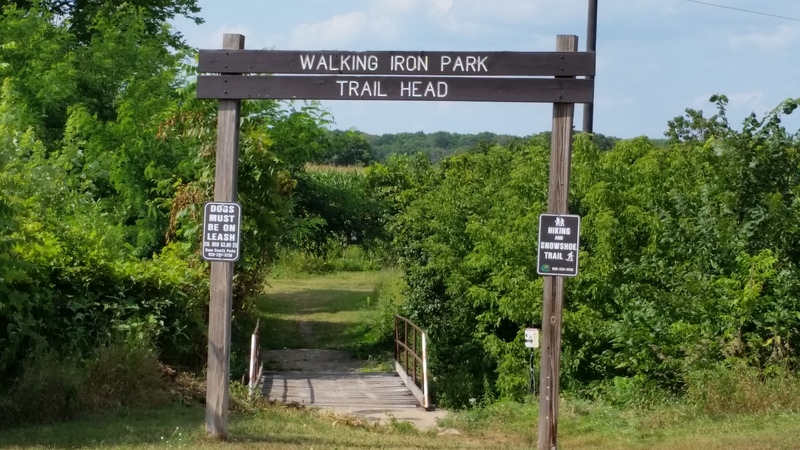 Today, I decided to go on my favorite Walking Iron Park trail. It’s the longest route I take. I enjoy it because it includes many different habitats: cornfields, prairie flowers, sandy ridges, wooded areas and a section down into a marsh. I ran from our house to the trailhead and through the wooded section, easily following the well-maintained trail. Then I arrived at the point where the trail gets unique. This section is less used than others and not as well maintained. Even less this year! A novice could easily get lost through this area as I plowed through a ticket of wild berry bushes. Then, the trail goes down a slope into the marsh where a huge oak tree completely crossed the trail. My options were to go through a thicker briar patch or over the large branches. The branches seemed less intimidating. The marsh area meant lots of mosquitos and gnats. Silly me failed to spray myself beforehand. Now I was walking and swatting at the same time. In the marsh, a flock of ducks flew away, scaring me as much as I surprised them. Squashing through the muddy part, I chastised myself for not wearing older running shoes. Climbing out of the marsh, I contemplated how this trail run/hike/walk was desperately looking like my life these days. When Jesus taught, he used prophetic hyperbole: seemingly outrageous statements to make a point. These words were meant to shake his hearers into taking his words seriously, but not always literally. An example is when Jesus said that it is easier for a camel to go through the eye of a needle than for a rich person to enter the kingdom of God. No, a camel cannot go through a needle’s eye. Jesus’ point is riches can be toxic to our souls. We should not let them enslave us. We also use silly hyperboles. When someone says, “I’m so hungry I could eat a horse,” do they really intend to? Do you know someone who can really snore louder than a freight train? Today, I found a meaningful hyperbole of my life. The overgrown sections of the trail seem a little too much like my disjointed life right now whereas the well-maintained trails are so what I aspire. The sandy, dry part of the trail is the parched state of my soul. The pesky gnats are the things I allow to distract me, like mindless time on the computer and checking Facebook too often. 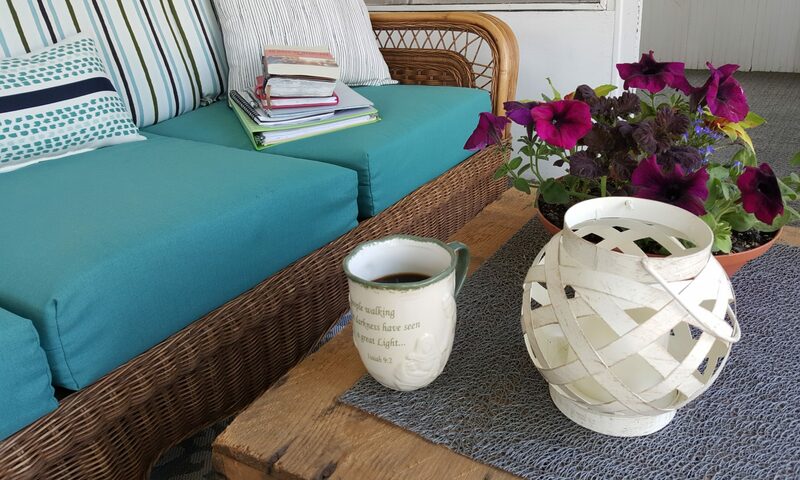 The briars are the thorns that I allow to take too much of my time and energy. My dirty running shoes remind me there are several areas which I know are sinful and yet I continue to overlook. The scared ducks remind me that maybe something else looms on my horizon and I cannot be afraid to step towards it. As I hiked and ran back towards the trail head, I reminded myself that hiking the daily is absolutely necessary. What is important is doing a bit each day to move myself towards the place I’d rather be. It’s not expecting myself to do everything ideally but allowing a fraction of what I’d like to do to get on my daily radar screen. Is there a prophetic hyperbole looming in your life right now? They don’t appear daily, but when they do, let’s ponder them, examine them and discover lessons that we can apply to our daily lives. Lord God, wherever we are in our lives today, there are lessons looming to help us draw closer to you. If our souls seem parched, dump into our lives things that will water them. Help us to see your desire to guide us daily. Amen. For the last several days, I have wanted to post an update about the baby robin eggs. About a week ago, four little robins hatched! We’ve tried to respect Momma Robin and not get too close. The babies loved their Momma. Every time Momma Robin came to the nest, their little beaks poked over the nest’s top, wide open for food. Momma Robin would get a worm, chew it up and carefully drop tiny little bits into each of her offspring’s mouths. Heart-warming moments. Until today. I was coming back from a run when Rick flagged me down. He wanted to know if I’d seen the disaster in the back yard. My heart sank. I knew there was trouble on the patio. An empty nest lay on the ground. The little babies did not survive whatever happened. Momma Robin quickly caught our attention. She was one angry wet hen, die-bombing near Rick’s head, squawking loudly the entire time. She was mad, angry and upset. Siblings Mary, Martha and Lazarus were close friends of Jesus. He visited their house, ate dinner with them and maybe even considered them family. One day, Lazarus got very sick. Jesus wasn’t too far away. Word was sent to him but he stayed away an exhausting three days. By the time Jesus comes lollygagging into town, Lazarus’ body is already in the tomb. The sisters are mad, angry and upset that Jesus didn’t come and heal Lazarus. He’d healed so many others. Why not their brother? When Jesus finally arrives, Mary’s words attack him like shrapnel, “Lord, if you had been here, my brother would not have died.” Mary is playing the blame-game. She lashes out at the One whom she feel has hurt her and not fully loved her brother. Jesus sees her hurt and has compassion for her. As tears spill down his cheeks, he asks to see where Lazarus has been laid. Ever lashed out at God, mad, angry and upset when something turned out differently than you expected? Ever screamed through tears, “Lord, if you had been here ….” and walked away from God because you felt God had walked away from you? This may describe Ms. Momma Robin this morning. My compassionate husband cleaned up the remains of the little babies and gave them a proper burial. Momma Robin didn’t come after him but seemed to move on. Mary found joy again when Jesus brought Lazarus back to life. Evil things will happen in this world. This is reality. When suffering happens, it is imperative that we find joy again. Otherwise, we become victim to anger. Lord God, how many times we have focused our anger towards you when something turned out differently than we preferred. Help us to develop a clearer understanding of why suffering happens in this world. Remind us anew that you never leave us even when we get upset with you. Amen.